I am excited to introduce my readers to the Kasina Mind Machine, a new mind enhancing product I’ve recently discovered. I’m not sure whether to call it my new favorite mind toy or my new favorite meditation tool—really, it is both, and more. 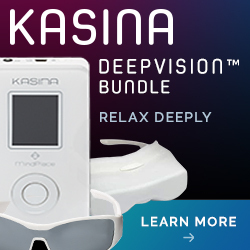 The Kasina mind machine; A meditation aid, a window to altered states of consciousness, a focus and attention trainer, a means of breaking undesirable states, a facilitator of accelerated learning, a mood shifter and above all, a tool that provides an audio-visual experience so enjoyable it defies words. In short, I love the Kasina by MindPlace. It’s Intensely enjoyable and importantly, incredibly easy to use (If I can operate it with ease, anyone can). The Kasina will undoubtedly be an integral staple of my ongoing, spiritual practice repertoire. I consider it a powerful tool for spiritual growth and self help. Did I mention the Kasina was super easy to use? I tend to balk at reading manuals, and cringe at the learning curve inherent in figuring out new techno gadgets. I’m old school. I don’t even own a cell phone. Simplicity is essential for me. The Kasina Mind Machine is intuitively designed. You pretty much just turn it on, and the operation is obvious. Push the on button, a screen appears on the sleek console front, choose your session, pop in the ear buds, put on the ganz frames, and away you go. For those who are a little more technologically savvy, you can also create your own sessions and tailor sessions specific to your preferences. The Kasina manual description of Patternity is as follows; Rich synthesizer textures combine lush visual effects to create a dreamy, slightly surreal and entrancing mind-scape. It was entrancing indeed, and words really do not do it justice. But I can say, my mind was absolutely captured by both the visuals and audio and the way they intertwined together. It didn’t take long at all before I lost all sense of my surrounding environment, as I became one with the beautifully colored patterns and captivating sounds before me. Forest and River: Another peaceful backdrop of nature, at anew locate. Frequencies start at 14 Hz and at 4 Hz for deeper relaxation into meditation. Wake: 18 Hz throughout. You may not need coffee or tea after this session. Not recommended before sleep. Sleep: A gradual descent from 10 Hz, pausing at 8 Hz before continuing to very slow modulations. Low key audio modulations overlaying the sounds of water in motion. 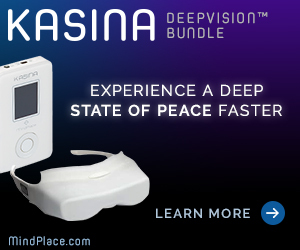 For those of you who have struggled with meditation, becoming frustrated at your mind’s tendency to wander off, but who continue to desire a deep, single pointed focused, meditative experience, the Kasina Mind machine is the answer to your prayers. The Kasina captivates mind and holds it, making wandering, monkey mind while trying to meditate, a thing of the past. The Kasina mind machine is not only enjoyable to use, but relaxing to the point that it actually alters the rate of heart and breath, slowing both, bringing mind into a place of profound tranquility and single pointed focus. It is the fastest means I have discovered to easily and effortlessly bring a busy, chattering mind into quietude. After a session, I feel rejuvenated, refreshed and most importantly centered and grounded. A powerful law of attraction tool, a meditative aid, or a tool to enhance spirit communications. There are so many ways you can use the Kasina. I am an affiliate for MindPlace which means I receive a percentage of all sales that originate from my website. Your purchase of the Kasina mind machine through one of my links, helps me to continue to create and post free articles. Thank you!